The Dual-Aircraft Platform (DAP) is a novel concept for achieving a low-cost atmospheric satellite in the lower stratosphere which utilizes a combination of wind and solar energy capture. 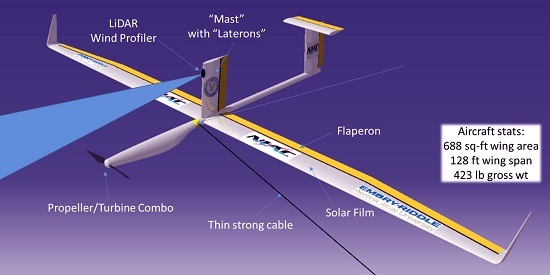 DAP consists of two glider-like unmanned aircraft connected via a thin, ultra-strong cable. Long duration flight simulations have shown the platform could literally sail without propulsion, using levels of wind shear persistently found near 60,000-ft, and substantially increase the energy available for useful payload operations. The central objective of the proposed Phase II effort is to perform autonomous proof-of-concept flight demonstrations of the DAP concept using a small-scale prototype at low altitude. Related objectives are develop specific flight maneuvers and mechanisms required for station keeping, and validate the autonomous guidance and control software. Flight demonstrations of the sailing mode of operation, as well as all other required maneuvers for stratospheric station keeping, will be conducted using the atmospheric onshore wind shear produced at low altitudes (< 500 feet) at Kennedy Space Center’s (KSC) Shuttle Landing Facility. Optimal dates/times for flight testing will be selected based on an historical weather assessment. Off-the shelf aircraft will be modified for DAP operation. The aircraft will be remotely controlled by KSC pilots during the first year, and will gradually shift towards complete autonomous flight control in the second year. Flight software will be developed and validated within the hardware-in-the-loop DAP flight simulator at Embry-Riddle Aeronautical University. Atmospheric satellites represent a long-standing, grand challenge to the aeronautics community, and have enormous potential societal and economic impact. Such airborne platforms are expected to diversify and expand surveillance capabilities (e.g., NASA’s earth science missions) and communications bandwidth and availability (e.g., for underserved remote areas of the US, emergency communications), at a fraction of the cost of orbital satellite networks. Successful proof-of-concept DAP flight demonstrations are expected to lead to commercial investment to build a large scale prototype.